This one was an accident. I think. But the most delicious accident. I had sliced up some potato for baked fries, Andy had the fryer on, and he was making Buffalo chicken. He wanted to experiment, so I gave him a few slices of potato. He dipped them into the batters and then popped them in the fryer. A few minutes later, he had these golden, delicious spicy buffalo potato bites. Preheat your fryer to 360 degrees. Use a mandolin on its medium setting to slice potatoes. In a bowl, place your hot sauce. In a separate bowl mix flour, paprika, and cayenne. Dredge slices in Frank’s Red Hot (it’s your wet base), then dredge in flour mixture. 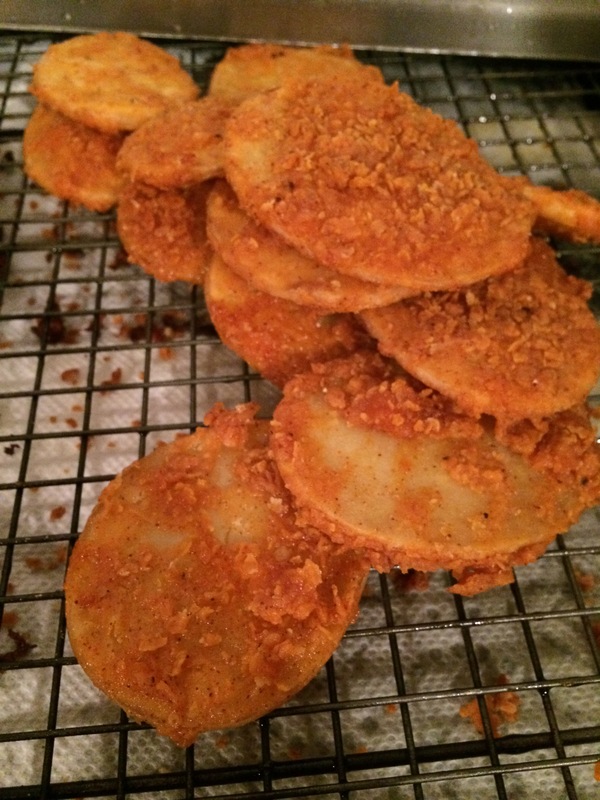 Shake off excess flour and place potatoes in fryer. Try not to overcrowd potatoes and do this in batches. Cook until golden brown, for about 3-5 minutes. Remove from fryer and let cool on a cookie cooling rack. This will remove excess oil. Remember to place paper towels under the cookie cooling rack. When cooled a bit, serve.